The Mary and John Gray Library cultivates student learning, supports individual and collaborative scholarship, and contributes to academic and professional achievement. 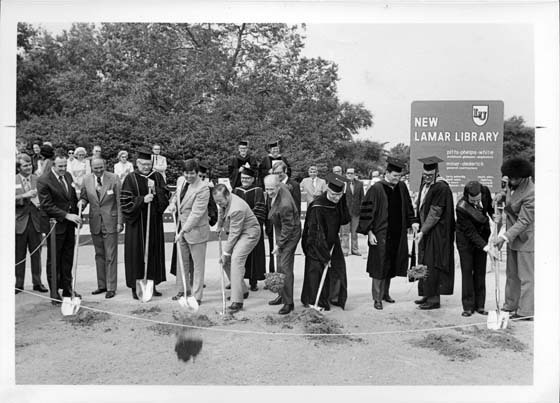 Ground was broken for the Mary and John Gray Library on September 17, 1973. Governor Dolph Briscoe and Congressman Jack Brooks, a Lamar graduate, were among the dignitaries present for the groundbreaking. The ceremony coincided with Lamar's Golden Anniversary Convocation, harkening back 50 years to the original establishment of South Park Junior College. The Lamar University Regents named the building after Mary and John Gray. The Chairman of the Board of Regents, Otho Plummer, declared that the regents "kept two goals in mind--that we would be expressing deserved appreciation for past services and that the name would be an inspiration for the future greatness of Lamar." The eight story structure, constructed as a visible monument for the campus, was officially dedicated on April 26, 1976. Among the many guests and speakers was Dean Edward G. Holley of the American Library Association, who had served as a consultant to the construction project. Previous Lamar libraries were housed in what has now been renovated as the Galloway Business building and in the old South Park High School. The eighth floor of the present building serves as the reception center for the university and the Golden Triangle community. There are two banquet/meeting rooms on the eighth floor. The larger of the two is named the Spindletop Room, in commemoration of the 1901 oil discovery that ushered in the modern petroleum industry era. The smaller of the two is named the Lamar Room, in honor of Mirabeau B. Lamar, the second President of the Texas Republic and the "Father of Education" in Texas. The large reading room/reception area that fronts the two banquet/meeting rooms on the eighth floor is named in honor of Miss Julia Plummer, who had a distinguished 31-year career as Head Librarian at Lamar. 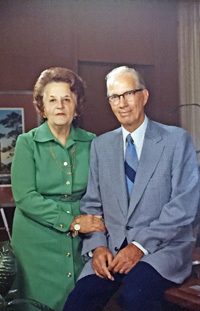 The two namesakes of the present Lamar Library have been considered the "First Family" of the university for as long as anyone can remember. In fact, John Gray (d. 2002) and Mary Hahn (d. 1996) were among the 125 students that comprised the original enrollment of South Park Junior College in 1923. They had known each other in high school and would later marry. From 1932 to 1939, Dr. Gray served as Head Coach, Athletic Director, and Dean of Men at what was then called Lamar College. In 1941, John Gray became President of Lamar College. 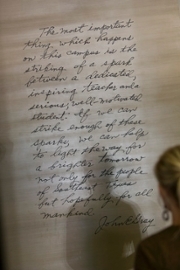 During his presidency, Dr. Gray oversaw many of the land negotiations which led to the current location of the campus. In 1952, one year after seeing the institution become a four-year school under the name of Lamar State College of Technology, Dr. Gray left to go into the banking field. However, in 1972, after the institution had been granted university status as Lamar University, then-President Frank Thomas decided to step down and return to the classroom. Dr. Gray, who had retired from banking, was asked to fill in "temporarily" as president for a second time. This temporary appointment would last four years and carry him into his seventieth year. The majority of those years had revolved around Lamar University in all of its incarnations.